Arsenal keen on signing Hirving Lozano? 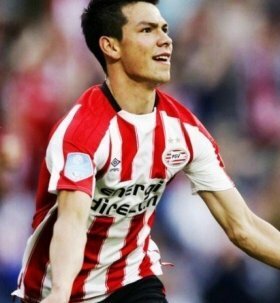 Arsenal are reportedly keen on acquiring the signature of Hirving Lozano from PSV Eindhoven, although they are likely to wait until the summer to make an approach. The Mexico international excelled at the summer World Cup where he scored the winning goal against Germany and he has carried the form through the current season with 15 goals and nine assists for PSV. According to TMW, a number of Premier League clubs are keeping an eye on the former Pachuca man but the Gunners are aiming to leap forward by making an initial enquiry regarding the attacker's services. However, it is suggested that the Gunners are unlikely to make a move this month due to the financial restrictions but they are preparing a potential £27m bid for the summer. Lozano, who is currently contracted to PSV until the summer of 2023, has also been linked with a probable switch to Napoli, who have struggled to end Juventus' dominance in the Italian top-flight.